I’ve always wanted to make one of these….. 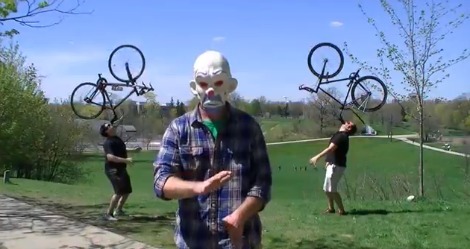 Along with my good buddy Ian Gray (middle) and twin brother Steve (left), we made this Harlem Shake video for my upcoming ride in The Ride To Conquer Cancer. I’m on the right, and yes, my brother and I have the weird ability to balance bikes on our chins. Support me in The Ride To Conquer Cancer, June 8th-9th in Toronto. We ride 100 miles from Toronto to Hamilton, then 100km back the next day. All proceeds go to The Princess Margaret Cancer Foundation. My team is called “Cycling For Cheese” and you can donate to us here. Or you can support me directly here.